By order № 215 of the Director of the Herzen State Pedagogical University on the 9th of September 1941 I was “accepted for the second year course of the History Faculty and provided with tuition remission, and a scholarship as an excellent student and a permanent participant in defense activities.” I was on the list of students from October 1941 till the 19th of March 1942. For health reasons I was not called to military service, but everyone who remained in the besieged city felt like a soldier. Because our university had a military hospital, an air-defence and fire-fighting division was set up. I became a voluntary fighter. At night we kept watch on the roofs of the buildings and extinguished the enemy’s incendiary bombs. We had food-cards so we ate in the canteen on Nevsky Avenue. With the onset of winter the work in the military hospital increased but our bread ration lessened. On the 20th of November it came down to the minimum – 250 grams for a worker-card and 125 grams for dependant-card and card for children. In the canteen you could buy with your card yeast soup, and a spoonful of lentil porridge with a teaspoon of cotton-seed oil. We celebrated New Year 1942 in the student residence on Zhelyabov Street. The lobby that used to be solemn and austere now stood empty, snow blowing through the broken windows. A demolition bomb had fallen on the grand staircase leading upstairs, and it had crashed down. Studies continued in the faculty though they were taught not in the usual lecture-rooms but on the ground floor or in the cellar, in classrooms fitted out in a hurry. Outstanding Soviet historians lectured, administered exams and tests in a cold room at temperatures below zero. But the strength of both students and professors was dwindling with every passing day. Cold was added to hunger. We needed firewood to feed the small surviving cast-iron stove which had a chimney jutting out of the window or a hole in the wall. From corridors, lecture-rooms, garrets, cellars we collected everything that could burn: furniture, parquet, books. Where there was no stove, we made a fire with a trivet in the centre of the room, fenced it with metal things to heat the room, and the smoke stayed in it for a long time. On the 8th of January I got into deep trouble: my food-card had disappeared. I had lost even a small piece of bread I needed till the next month. There was no chance of recovering the card. Someone advised me to go to the Mitninsky Market. There it was possible to buy oilcake or a ration of bread for 100-150 roubles, or to barter things. But students had neither money, nor things to barter. I was tired. Without hope of eating anything I went to the university and settled in the cellar in the History Faculty building. I got a place near the entrance of the long, dark room with its low half-vaulted ceiling. There were over a hundred beds on either side of the passage in the centre of the room, trestle-beds. Beside some of them there were tables. Mattresses, blankets and pillows were brought in from the students’ residence. At the end of this corridor-looking room there was a huge oil lamp, like a torch. At one moment its light would flare up and illuminate the miserable asylum and people’s pale faces, at another moment it reduced the room to a drowsy twilight. It was rather warm there. Noises from the street could hardly be heard. And there I lay. On the third day a girl from a team of medical helpers gave me a cup of hot water. Lena from the Literature Faculty who lay on the nearest bed shared her scanty ration with me. I buried myself in rags, got warm and fell asleep. More than once Lena offered to share her ration. To save scientists, men of letters and art from starvation over 200 hospitals were opened in the city where the length of stay was about 8-10 days. Those who suffered dystrophy were fed and treated there. One such hospital was opened in the Herzen University because it was a medical aid station. I, a lowly student, was taken to the hospital along with others. I stayed in the hospital till the 1st of February when I got a new food-card. My appearance in the Faculty surprised everybody because everyone thought I had died. I recognized my fellow students (girls) by their voices: they looked like old women. As to the boys, only three of the twenty had survived. I was shocked by the death of Vanya Fialkovsky. For a long time he had not gone to the plant where he used to work as a turner. Jelly made of joiner’s glue didn’t help him. He lay flat on his back in the bed nearest the stove. His short-sighted eyes were hidden by the thick lens of his glasses. There was an untouched ration of bread under his pillow. The night passed, fire glimmered in the stove. In the morning girls were going to the bakery, and they came up to Vanya. They brought a lighted match to his eyes. The pupils of his eyes didn’t respond to the light. There was still warmth in his chest, but his pulse could not be felt. Thus our amiable, good Vanya, our kind, understanding boy died. In the afternoon a military car came. The corpses were loaded into it. We wrapped Vanya in a sheet and cotton blanket and put him carefully into the car. I asked the driver if I could accompany my friend to the Volkov Cemetery. I saw besieged Leningrad from the car. It was quiet and deserted. Here and there passages to the buildings could be seen among snowdrifts. There was a deep cut along Nevsky Avenue. Walls of buildings were breached; there was no glass in the windows, and on the ground floor the windows were blocked up with sandbags. Somewhere in Tchaikovsky Street a building was burning. There was nothing to extinguish the fire with: there was no water. 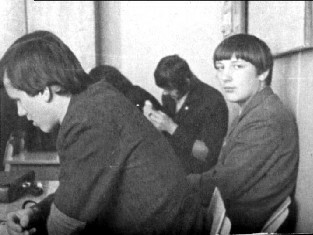 In February talks about the evacuating the university began, and lists were made, dates were set; but only in the middle of March did I get my evacuation card and an assignment to somewhere in Kurgan. I packed my suitcase. Its contents consisted mainly of books and photos. In the evening I went to the Finland Station on foot. It was thawing and the streets were slippery. It was difficult to carry my suitcase, and therefore I dragged it several kilometers. Servicemen in short sheepskin coats carried us out of the railway trucks in their arms and put us into cars covered with sheets of canvas. Cars went back and forth along the icy road in a continuous stream. Happily we reached the village Lavrovo, and then we went by train past Volkhov and Babaevo to Yaroslavl. Doctors took me off the train that went to the east (they said I would die on the journey anyway) and sent me to Ribinsk where my parents lived at that time. Thus my story of the first winter of the siege ended happily.